London - (OMFG! Mess): The love child of cold war UK traitor Guy Burgess and Raine, Cuntess (sic) Spencer - Princess Di's ex-stepmother - is off on a Foreign Orifice jolly to Brunei at the end of the month. Arthur Burgess, a.k.a. Charles, Pretender to the Al-Qaeda Puppet Throne, is on a fence-mending mission to fence more priceless stolen assets that Brunei's Prince Jefri plundered from the legal owners of the UK Crown Estate. 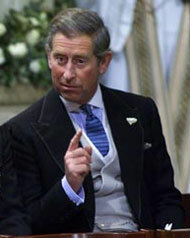 Charles, 69, is to drag his gargoyle fag hag Camilla on the trip after a tip-off that some more bling booty might be forthcoming on the trip which the couple hope to pawn in good time for Xmas. Clarence House coffers have taken a miserable hit on the Footsie this month, plunging the Pretender's assets to a few IOUs from the Saudis "and 100 kilos of crack cocaine currently enroute to London" via the Brunei diplomatic bag - according to reliable sources. Kate Middleton works for Vladimir Putin.